How Blockchain Helps Brooklyn Dwellers Use Neighbors' Solar Energy : All Tech Considered A project called TransActive Grid is testing a new way to trade solar power among neighbors. For now only credits are being traded — not actual energy — using the technology that underpins bitcoin. 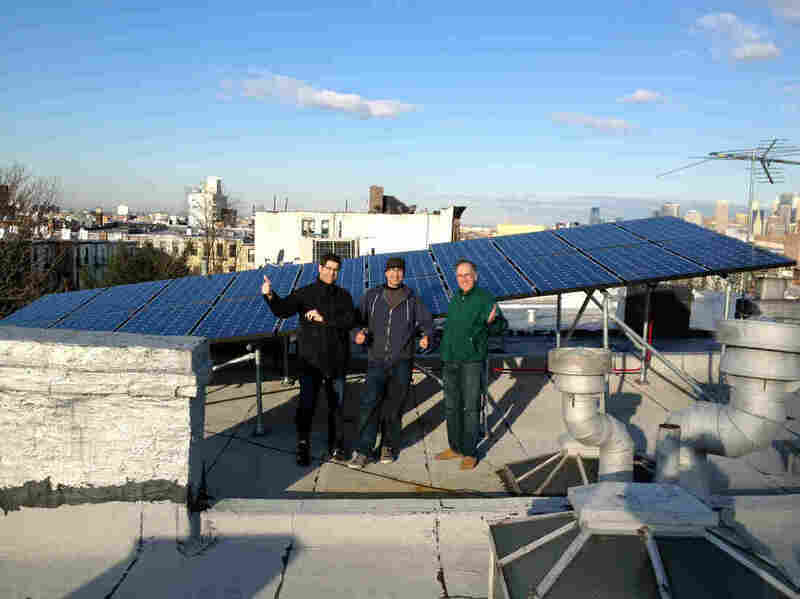 Eric Frumin (right) stands in front of his solar panels on the roof of his Brooklyn home alongside architect David Cunningham (left) and AeonSolar's Allen Frishman (center). Robert Sauchelli doesn't have a solar panel, but he's all for the idea — before he retired, he devoted 21 years to energy efficiency work at the Environmental Protection Agency. To show his support, Sauchelli has been paying an extra 7.4 cents per kilowatt-hour to a clean power company, called Green Mountain Energy, through his energy supplier in Brooklyn, Con Edison. The green energy credits Sauchelli was buying helped subsidize cleaner energy production. But Green Mountain Energy is based in Austin, Texas; its work wasn't likely to benefit him directly in New York — despite increasing his electricity bill by more than a third. In April, Sauchelli joined a new project, a small community energy market that's a test run for both the idea of a clean-energy local microgrid and the use of blockchain technology to enable its transactions. The project is called TransActive Grid — a platform developed by LO3 Energy, a technology firm that focuses on distributed energy initiatives, and Consensus Systems, a blockchain venture developer. It's a trial of a new way to trade solar energy among neighbors, running on a Brooklyn street between 15 households: two energy producers and 13 potential buyers. Now Sauchelli contributes an extra 7 cents per kilowatt-hour, which adds up to roughly $8 to $14 a month — and that money goes straight to his neighbor, Eric Frumin, whose rooftop solar panels produce more energy than he needs. "I know exactly where my money is going"
The tricky part is this: by law, individuals aren't allowed to sell or buy actual electricity directly from each other. That means what Frumin sells to Sauchelli through the TransActive Grid marketplace are tokens, the same type of credits that Sauchelli was previously buying from Green Mountain Energy. They represent the environmental benefits of Frumin's electricity production, except now, for Sauchelli that production is local. "I know who the participants are," Sauchelli said, "I know exactly where my money is going, and I know that the benefits are being engaged right here in my community." In the transaction between the two neighbors, blockchain is the trustworthy ledger. Most famous for enabling the creation of cryptocurrency bitcoin, blockchain is a virtually unfalsifiable, transparent, digital ledger that instantly records all transactions and allows all of its users to act as verifiers and overseers of the system. To buy his green energy credits from Frumin, Sauchelli goes to an online portal to see how many are available for sale. That data is gathered through smart meters that producers participating in the TransActive grid project have installed in their houses. When Sauchelli makes the purchase, blockchain technology takes care of the accounting part: It records the terms of the contracts, tracks how many energy credits have been sold, by whom and to whom. The system acts also as an instant and secure confirmation of both the verified ownership of a property and its exchange in a way that cannot be questioned. "Once something is in the blockchain, it's in there forever. You can't go back and rewrite history," says Campbell Harvey, professor of finance at Duke University. He teaches a course on innovations and cryptoventures, in which he argues that the U.S. power grid could gain efficiency by using blockchain. A blockchain ledger allows the transaction to happen directly between the consumer and producer. "Blockchain contracting allows for very efficient low-cost contracting to solve problems like the purchase and selling of energy," Harvey says. Building off its TransActive Grid in Brooklyn, LO3's next project is an actual local energy network, says Director of Operations Scott Kessler. Brooklyn Microgrid aims to create a local, neighborhood-powered grid that could operate in parallel to the main grid. One of the appeals of a microgrid is its potential to provide electricity to homes even if the main grid goes down in the event of a natural disaster, says Vijay Modi, director of the Sustainable Engineering Laboratory at Columbia University. "Even if the larger infrastructure gets disrupted for some reason, you have the potential to meet that critical need locally," Modi says, as other people in the neighborhood may still be able to produce and sell energy. New York state is showing some interest in this idea: It's holding a $40-million statewide competition to develop microgrid projects. But apart from legal restrictions on peer-to-peer energy sales, such transactions would have to overcome several other obstacles if they were to become commonplace. One of them, Modi says, is figuring out where central utilities would fit in such a scheme. The Edison Electric Institute, which represents investor-owned utilities, sees electric power companies as part of the future microgrid systems. Richard McMahon, vice president of energy supply and finance for the organization, says these utilities have invested billions in grid improvement projects, including microgrid exploration. McMahon says the push for microgrids is simply "one of many areas in which utilities are working on the expansion of the existing grid." But he doesn't envision a future in which microgrids don't need to rely on the main grid in some way: "People want power that is reliable, affordable, and sustainable," McMahon says. "The grid is really delivering on all three of those things." Yet if microgrids develop to the point where central utilities just become a backup service, Modi says, the cost of that service would soar "because maybe the cost of maintaining that centralized grid is the same but people" aren't using it as much. Another obstacle is smoothing out any bumps in the actual development of a new kind of grid. "Our expectations of reliability are extremely high," Modi says, "and I think as we do these new innovations, right, that potentially creates, even small probabilities of disruption." One more hurdle to scaling these systems is the cost of actually producing green energy. Frumin says his solar installation in Brooklyn cost him $40,000. Even with $30,000 in subsidies he received from the federal government, New York City and the state of New York, Frumin will have to sell a lot of energy to his neighbors to cover the cost of his investment. But Frumin notes that, for him, the cost of the system is offset by the savings on his power bill. LO3 Energy CEO Lawrence Orsini says he doesn't know what the TransActive grid project will turn into exactly, but it's a first step towards empowering energy consumers. "We took the meter off the wall," he says, "we put it into people's hands, and we expect that there are going to be a lot of interesting and innovative applications."